Last week we took a trip out to New Jersey to visit our families. Despite some bad news that put a slight damper on the day, we had a delicious lunch with my parents and siblings and then visited Shawn's mom at her equally delicious workplace. Our families treat us so well when we visit... sesame chicken salad for lunch, a homemade pear & chocolate tart for dessert, and a bag of locally roasted coffee? How come we don't visit more often?! I'm pretty sure everyone who reads this blog is either family or friend and already knows this, but just in case I'm wrong, here's a small tidbit of information that I haven't mentioned before... over the next few months my family is gradually moving to Switzerland for a few years (and leaving Shawn and I behind, those bastards!). They're taking the dogs and the cats with them too, and since the dogs are scheduled to fly out next week, this was our last chance to see them for a while. Not that I don't love seeing my family too, but I know they'll be able to travel back to visit more often than the dogs will. 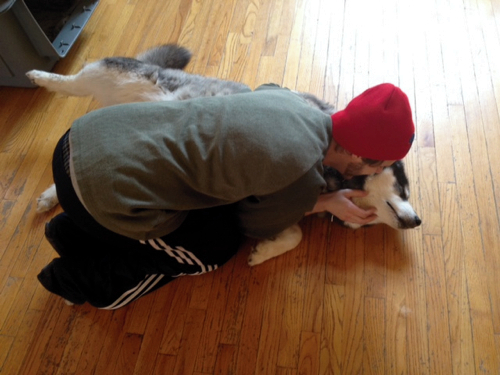 Shawn and the dogs have a special relationship - he used to housesit them when my family would go on vacation - in fact, I think they're usually happier to see him than they are to see me! Check out that bear face. 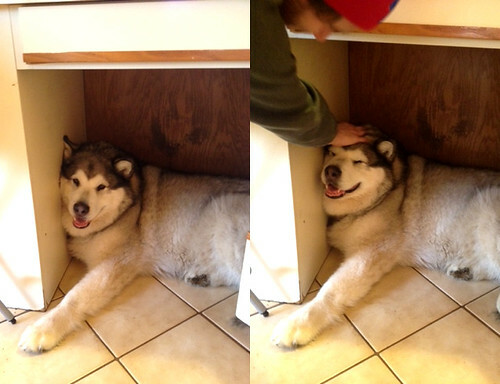 (It's no wonder we call him a big bear...) Kusko was growling right before these were taken, but don't mistake that for unhappiness - his smile will tell you otherwise. Malamutes make such interesting noises! Shawn loves Luna, Luna loves Shawn. I caught a Luna smile on camera! It's nearly impossible! Shawn wears a beanie pretty much all the time, so whenever he takes it off his hair tends to be a crazy mess of Kramer hair. 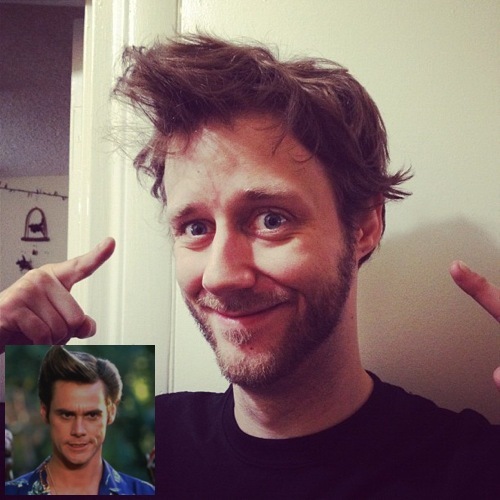 After arriving home from our road trip though it looked more like Ace Ventura hair, so he had me snap a photo. Between the three of them, this turned out to be a very hairy post indeed. 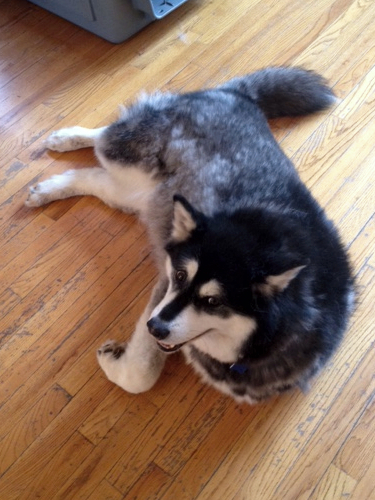 Oh my goodness your big ol Kusko is SO cute! I think if he was mine I would just hug him all the time! P.S. That hair is hilarious!